Antalya was built in 1950 just over the road from Old Pier Beach and in 2007 was extensively and beautifully renovated. It is truly in prime position for a beach holiday and can sleep up to 13 people. It is an ideal place to stay for golfers visiting the nearby Barnbougle Dunes or Lost Farm golf courses. There is a fully kitted out fabulous kitchen with lovely stone bench tops. Open plan living means that from the kitchen sink you can look past the leather lounge suite to the glass topped dining area and beyond to the ocean. In fact you can see the ocean from the fantastic outdoor entertaining area outside the back door as well as from the large timber deck at the front of the house. In the rear entertaining area you will find an umbrella type roof suspended by stainless steel wires from an old pier pylon that was salvaged from the beach nearby in 2006. This roof shelters the gas barbecue and the outdoor bar fridge. Oodles of seating in this area mean it is a great place to entertain your friends. The main bedroom has a comfortable queen sized bed and a beautiful tiled en suite Another bedroom has a double bed and there are 2 bunk rooms. One of these sleeps two people and the other sleeps four. Under one of the bunk beds is a pull out trundle and in the lounge is a double sofa bed that can be set up if needed. All linen is included. You will only need to take beach towels. We accept credit cards (Online through Stayz) or direct deposit to our bank account. For this option we will email an invoice to you on request. This home was perfect for our needs. Quite spacious and clean with great outdoor entertaining areas. Would happily recommend to anyone looking for a quiet and well equipped home. We love Antayla and have stayed many times. 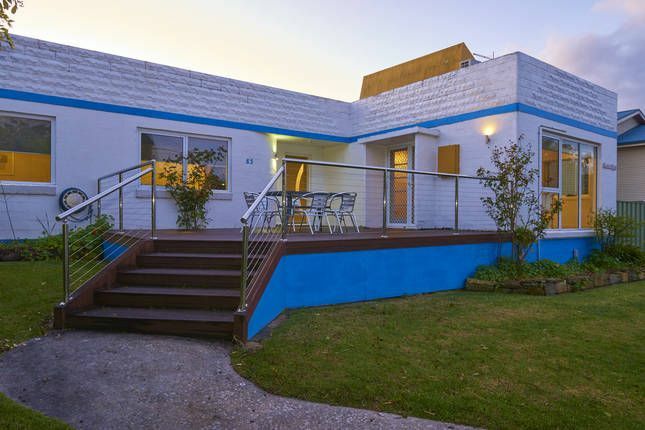 It is the perfect location straight across the road from the beach. The house itself is very comfortable and has a great backyard and bbq area. Spacious property in a very pretty location. Well equipped kitchen. Antalya would be without a doubt the best equipped self contained accommodation we have ever stayed at. With a mix of 12 adults and children there was not a thing more we could have needed. The only think we wished for more a few more days to stay!